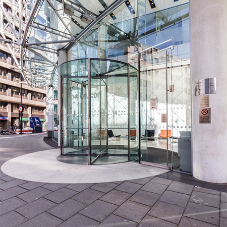 High-capacity revolving doors with 2, 3 or 4-wings and aestatic design are state-of-the-art manually operated or fully automatic entrance systems. Very well applicable for hospitals, airports, theaters, shopping malls and conference areas. Enlarging the diameter increases the capacity and automatically creates a wheelchair-accessible entrance. Security is top priority for us and we work under EN 16005, the machine guidelines, TUV and other directives. Materials Stainless Steel base frame with a aluminium, SS, bronze or bespoke cladding. Aestheticall all glass design with minimal framing and glass roof. Manual or automatic operated. Finishes Aluminium, SS, bronze or bespoke cladding. Sizes Diameters > 1500 mm. Heights < 3000 mm. 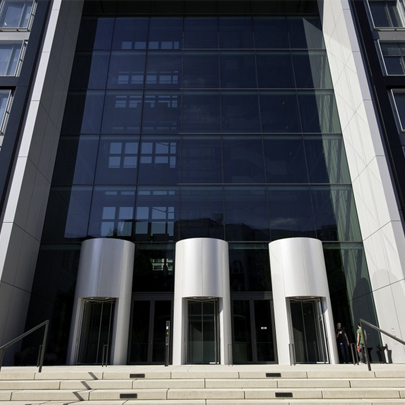 TALL Door versions > 3 meter up to 10 m.
Other guarantees 30-year guarantee with Gold a maintenance contract.